For divers, a good watch is far up the list of essential equipment, right up there with a knife and way ahead of strobes, lights, cameras and a lot of the other gear people spend money on. As well as its basic function of telling you the time a watch is your fallback device for calculating how much bottom time you have left – for many sports divers it’s their only device. The functions of a watch are basic compared to even the simplest dive computer but, if you know how to use it, it’s still adequate for diving as long as you’re using air and not dive gas. A good dive watch needs some extra features that aren’t essential on an everyday one just to survive, never mind to do its job. There are a lot of factors to look at though, so it’s not as simple as going into a store and asking for a dive watch. Obviously, a dive watch has to keep the water out, or it’s not going to last very long. Most modern watches are marked as water resistant and often have a depth rating, for example, 50 meters, but these are just ratings of how well the case is sealed. For diving, you need a bit more than that. To be precise you need an ISO 6425 certified watch. 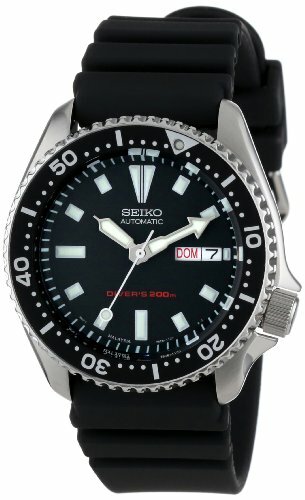 A normal watch might say “Water resistant 50M”, but an ISO 6425 one would be marked “DIVER’S 200M”. This standard means it’s been tested for reliability, condensation, its ability to resist shock and salt, and some other features. Any watch that’s not ISO 6425 isn’t suitable for diving. Timekeeping device. Another requirement for a certified dive watch is that it has a timekeeping device. This can be a digital display or the traditional bezel. Its purpose is to show you how long you’ve been underwater without having to keep track of when you went down. If the watch uses a bezel it has to have a ratchet so it only turns in one direction. This is so if it’s accidentally bumped after the dive starts it will always underestimate remaining time. It’s not as easy to see a watch face under water, for two reasons. As light passes from the air inside the watch crystal to the water surrounding it refraction occurs. That can be reduced by careful shaping of the crystal. Another problem is that there’s less light underwater – sunlight is absorbed rapidly, and by the time you’re thirty feet down 80% of the light has vanished. An illuminated face, either by a light or with luminous inserts, is essential if you’re diving much deeper than that and a good idea in any case. Power meter. Battery powered ISO 6425 dive watches need to have an indicator to show that the battery is about to die. This can be indicated by the second-hand jumping, or by a warning on a digital display. Some mechanical watches also have a meter to show how much energy is left in the spring. Obviously, the bracelet on a dive watch has to stand being immersed, so you won’t find leather ones. Rubber, polymer or some fabrics can be used, as well as metal links or mesh. Make sure it can be easily adjusted to fit over the wrist of your wetsuit. Any dive watch will have those basic features, but there’s a lot of variation. Most are certified to 200 or 300 meters and can also be used as an everyday watch. Others are rated for more extreme depths. Ratings of 300M to 1,000M are usually aimed at saturation diving; any suitable for mixed gas diving will add L M to the DIVER’S marking on the case. There are also watches rated at much more than 1,000M; often these are made to generate publicity. In 1960 a Rolex Deep Sea prototype survived a trip to the bottom of Challenger Deep, the deepest point in the oceans, almost 36,000 feet down – but it was fixed to the outside of a deep-sea submersible because no diver can resist the pressure at that depth. The CX Swiss Military is available to the public and rated at 6,000M. No diver can survive that either. The price for this level of performance is very high cost and extreme size; the CX is almost two inches in diameter and more than an inch thick and weighs over half a pound. Assuming you want a watch designed for depths you can actually reach without being mashed flat, there’s a wide range available. Here are our three top picks. 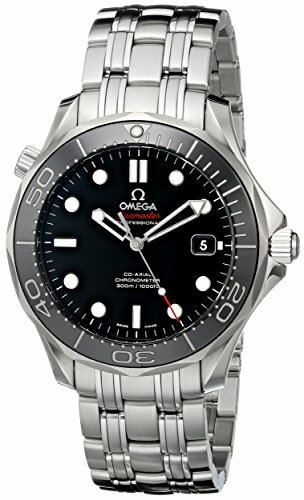 Omega is one of the leading names in dive watches, with a reputation for quality that’s hard to beat. This Seamaster, with its IP address model name, will show you why. It’s beautifully made, feels incredibly solid and does exactly what a dive watch is supposed to. The Seamaster is a conventional watch with a stainless steel base and linked steel bracelet. The catch on the bracelet has a safety catch that only opens when you push two buttons simultaneously; Omega appreciate that, with a list price of $4,400 (check this listing for the latest live prices), you really don’t want to lose this. The bezel is also steel with a dark gray ceramic coating, so it contrasts nicely with both the case and the black face. The crystal is made from ultra-hard synthetic sapphire, so it’s as scratch resistant as it could get without actually being a diamond. It also has an anti-reflective finish for better visibility both in and out of the water. Luminous inserts in the hands and face give outstanding contrast with the black background in any light conditions, making it easy to read. A depth rating of 300M means you can safely use the Seamaster for single gas diving. It’s also at home on land – it’s chunky, but not ridiculously large. It’s also self-winding, with a 48-hour power reserve to keep it ticking when you take it off for the night. Verdict: An excellent watch, although of course quality doesn’t come cheap. If you want a dive watch that radiates style, without giving up any practicality, this one will suit you perfectly. This is an impressive looking full-size dive watch with all the features you could want. Unlike the Omega, it has a quartz movement powered by Citizen’s innovative Eco-Drive system. This will turn just about any light source into electricity, so it doesn’t need expensive battery changes – this can easily cost over $100 on a dive watch because you usually have to send it back to the factory. Like most dive watches the Promaster has a stainless steel case rated to 200M or 660 feet. That’s plenty for most recreational diving. The case itself is quite conventional, with a unidirectional bezel and chunky controls arranged would the sides. The face is a real strong point though. It’s black, making a nice contrast with the luminous inserts and brightly colored high-visibility hands. The bracelet is heavy duty polyurethane with a solid and secure buckle. That will bring you some welcome peace of mind – at $950 (although you can usually find it for well under $600) (check this listing for the latest live prices) this isn’t as pricey as the Omega, but you still wouldn’t want to watch it pop off your wrist and vanish into the abyss. 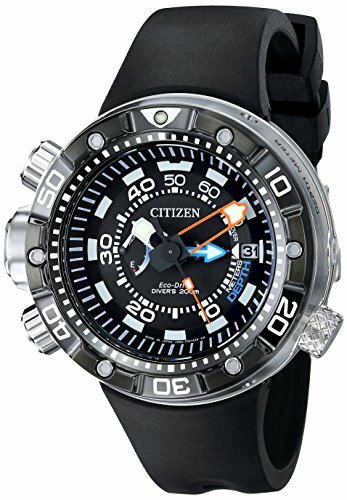 The Citizen is quite a large watch, just under two inches in diameter and over half an inch thick, but it’s not too heavy and looks great with casual clothes when you’re out of the water. There’s a lot of functionality packed in there though; one really nice touch is a depth meter calibrated down to 70 meters, which is a nice backup to your dive computer or will do on its own for shorter dives. Verdict: Clever use of technology and great build quality make for a very competent watch. If you’re looking for a watch that’s affordable, but still has the vital ISO 6425 approval, this Seiko is a great choice. There are cheaper dive watches out there – you can get one for under $50 (check this listing for the latest live prices) if you really try – but at that price corners are being cut and you wouldn’t want to rely on them for anything other than snorkeling. The Seiko, on the other hand, is a fully ISO compliant design and will do everything you need it to. Like the Omega, this is a self-winder, although its power reserve is smaller – less than a day if you’re not wearing it. However, it’s sturdy and also quite compact, with a 41mm case that’s only just over half an inch thick. The face is black with bold, easy to read luminous inserts and a day/date calendar. The unidirectional bezel is low profile but has a gearwheel edge for easy operation. Because it doesn’t pack in any extra features there’s only one control – the winding crown, complete with screw-down cap. This is set off center to reduce the watch’s width, which is a nice touch. The bracelet is polyurethane and seems very solid, with a good secure buckle, while the crystal is hardened Lexan. Verdict: A very good dive watch that won’t break the bank; this will suit most recreational drivers just fine.